A key concern of this project is the representation of labour. It is, therefore, critical to consider photographers and practitioners whom have sought to address such representations in meaningful, sustained and innovative ways. Known mainly for his images depicting the construction of the Empire State Building, here the specific reference is the early project work of Lewis Wickes Hine. Ground-breaking for its subject matter and the means and methods of representation that he engaged, this is further underlined in how the word, documentary, did not exist at this time in relation to the description of such visual undertakings. 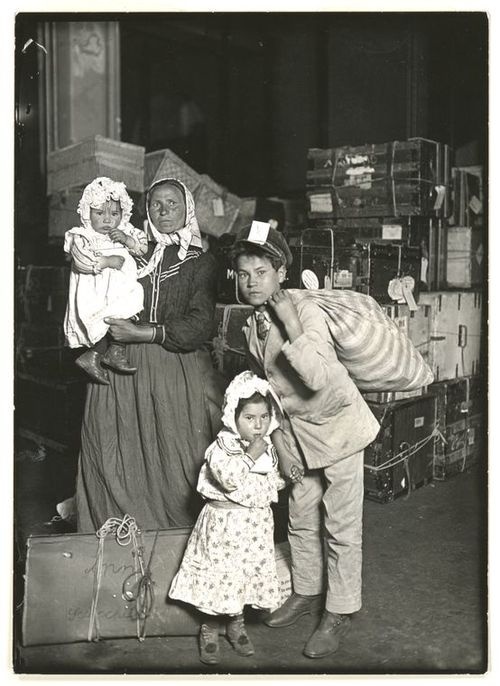 In 1904, the teacher went to Ellis Island to witness the largest ever migration to the United States. Hine began making a series of immigrant portraits, which he would continue until 1930, later described as ‘incontrovertible documents of the human meaning of history’s greatest migration. The mass aspect of Ellis Island was left to the statisticians and social cartographers. Hine took care of the human equation’ (McClausland quoted in Rayner 1977: 42). Hine had met and befriended the wealthy businessman Arthur Kellogg, and through his patronage began documenting change for The Charities and Commons Magazine, later re-titled The Survey (Rayner 1977). He used photography ‘as a means to an end – to call attention to social injustice, to campaign for change and to celebrate the dignity of working people in the modern world’ (Panzer 2002: 3). He would devote his life to the portrayal of, among others, the plight of child labour, working conditions, the role of women, tenement living, veterans from the Civil War, disabled workers and the role of visible minorities. It is interesting to note how he circumvented issues concerning access to factories regarding child labour: ‘he pretended he was after pictures of machines…while one hand in his pocket made notes on ages and estimated sizes’ (Trachtenberg 1989: 201). 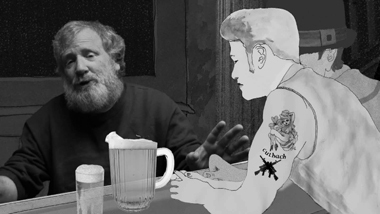 Particular attention should be given to Hines’ subject position as manifest both in his working process and the framing technique employed. This relates primarily to a large part of what I would describe as his ‘early work’ from 1905 and up to, and including, 1920. Hine generally positioned his subject at eye level and in the centre of the frame. Whether individual or in groups, they presented themselves to the camera and the viewer. He maintained ‘careful notes’ of his encounters at all times and the work was usually accompanied by extended titles and captions (ibid. : 20). Hine was aware of the potential for allegory; ‘a picture is a symbol that brings one immediately into close touch with reality’ (Hine  1989: 207). 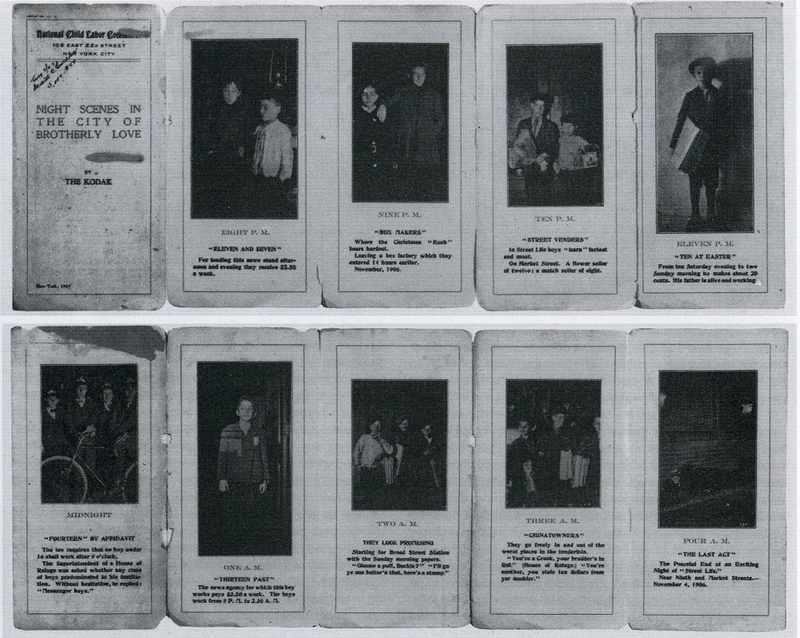 Alongside his meticulous note-taking and written documentation, Hine maintained albums of his edited photographs (see above) – numbered and assigned, specific to each location where the images had been made. What is significant also is the sophisticated dissemination of the vast amount of photographs Hine generated. Intended to affect public opinion and, thereby, government policy, there was a considered and critical mindfulness concerning the distributive possibilities of this visual material. 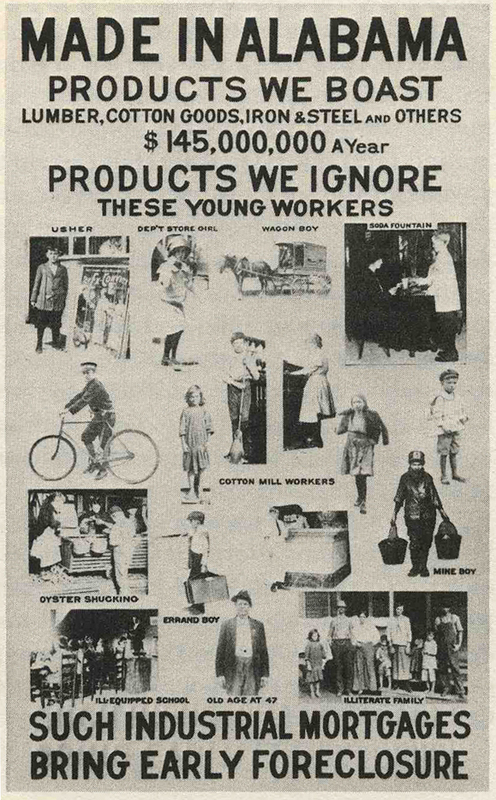 For example, dedicated images surrounding narratives like this poster (image above) from Alabama addressing the plight of underage labour. While incorporating a sense of irony in the child now being the product, in turn it focuses attention on the fact that through/from the use of such child labour, factory owners could face the severest of penalties. The image below is what I would consider a key document from Hine’s work dating from 1907, ‘Night Scenes in The City of Brotherly Love’. Sponsored by Kodak, the pamphlet was published by the National Child Labour Committee. 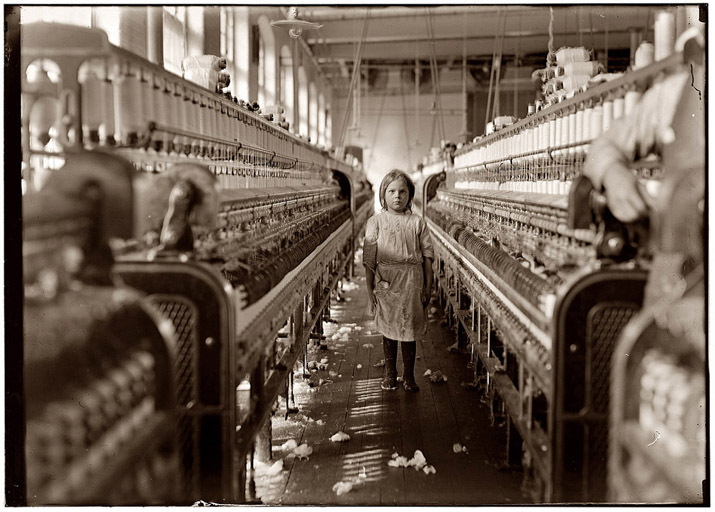 Freedman, R. & Hine, L. (1998) Kids at Work: Lewis Hine and the Crusade Against Child Labor, New York: Sandpiper. 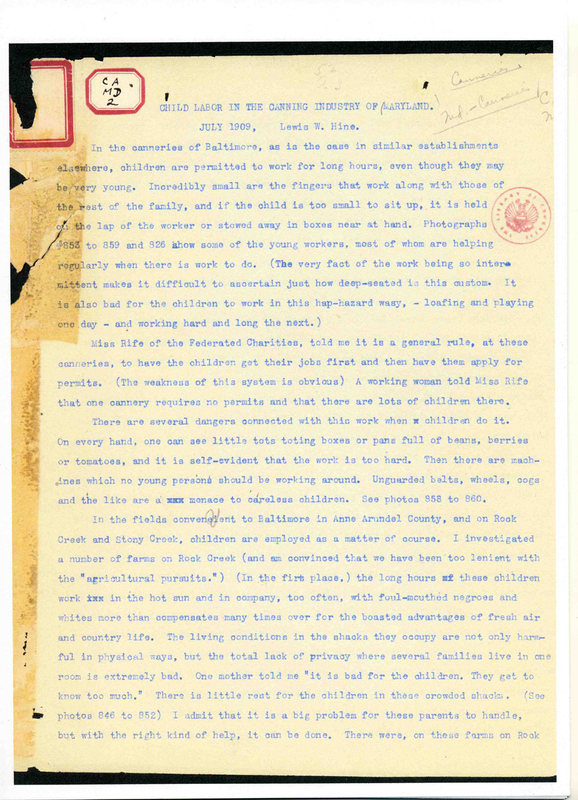 Hine, L. (1909) ‘Child Labor In The Canning Industry of Maryland’, United States Library of Congress, <http://lcweb2.loc.gov/pp/nclchtml/nclcreport.html&gt;. 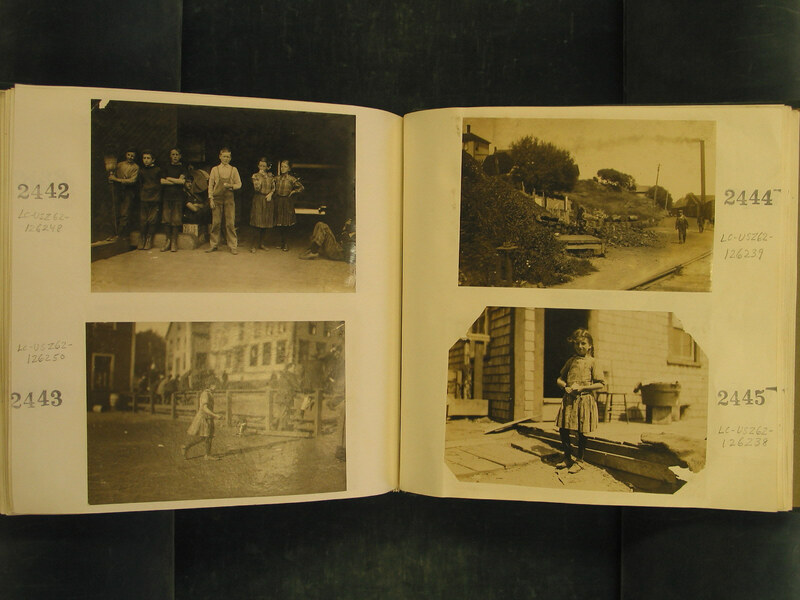 McCausland, E. (1971) ‘Lewis Hine: Portfolio (review)’, Image, Vol. 14/1, 16. Panzer, M. (2002) Lewis Hine, London: Phaidon. Sekula, A. (1997) ‘On “Fish Story”: The Coffin Learns to Dance’ in Camera Austria, Camera Austria, Graz, Issue 59/60, 49–59. Trachtenberg, A. (1989) Reading American Photographs: Images as History, Matthew Brady to Walker Evans, New York: Hill & Wang. A version of this text was included as part of my practice-led doctorate thesis, the abstract of which can be viewed here. You are currently viewing the archives for August, 2012 at THEMARKET.